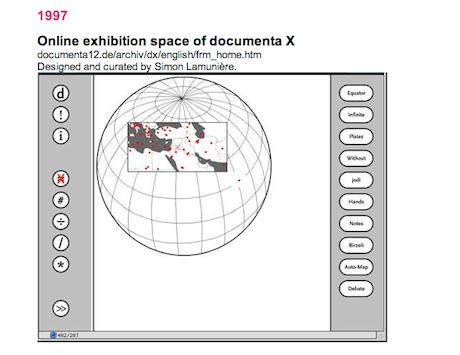 Screenshot of Oliver Laric, An Incomplete Timeline of Online Exhibitions and Biennials (2013). Web page with text and still images. Rhizome is pleased to present a new artwork by Oliver Laric, An Incomplete Timeline of Online Exhibitions and Biennials (2013). Initially intended for inclusion in BiennialeOnline 2013 organized by ARTPLUS, the work is now launching as part of the Rhizome ArtBase instead. Initially billing itself as "The first exclusively online biennial exhibition of contemporary art," BiennaleOnline 2013 convened 30 leading international curators to select a total of 180 artists to be included in the project. Initially, as ArtFCity reported, the site planned to charge $80 for access in its first week, followed by a $10 subscription fee thereafter; later, organizers said it would employ a "pay what you want" model. For his submission to BiennaleOnline, Laric compiled a list of exhibitions and biennials that had taken place online between 1991 and the present. The list is not meant to be definitive, but to offer an introduction to the great many precedents that the organizers of BiennaleOnline might have cited. In the end, a more careful look at these precedents might have been useful for ARTPLUS. Their format requirements were narrowly defined; for example, Laric was not allowed to include any outgoing URLs in his work. Ultimately, ARTPLUS was unable to find an acceptable way to display an HTML-based artwork within the exhibition, and so Laric yesterday asked curator Martin Germann (who Laric credits for being supportive throughout the process) to notify the organizers of his withdrawal from the show. Rhizome has added this work to the ArtBase not for its merits as an art historical resource (although it will undoubtedly be useful for many researchers), but rather for its as value as an example of online site-specificity. The work engages not only its intended exhibition site (the BiennaleOnline) but also the less tangible "discursive site" in which it is situated. In particular, it touches on an issue that was discussed in a recent must-read article by Caitlin Jones for Mousse Magazine: the history of new media is often treated by critics and art historians as if it functioned within a "specialized field of its own," having no contact with or relevance to "the mainstream art world." Laric's work can be seen as a response to this fallacy, an assertion of one artist's belief that these histories are, of course, thoroughly intertwined. Disclosure note: Laric's piece makes mention of an online exhibition curated by Michael Connor for Rhizome in 2005. 1 Miwon Kwon, "One Place after Another: Notes on Site Specificity," October Vol. 80 (Spring, 1997). p 103. 2 Caitlin Jones, "Conceptual Blind Spots," Mousse Issue 38 (April 2013). Online. Accessed 25 April 2013. 3 & 4 Claire Bishop, "Digital Divide," Artforum Vol. 51, No. 1 (September 2012). Online. Accessed 25 April 2013. Also quoted in Jones. afair, hell.com became an art platform later, probably 1997–98. Auriea Harvey and Michael Samyn can remember better. 1998 art.teleportacia.org "the first real net art gallery" was launched with miniatures of heroic period exhibition. was an important event: 5 net artists offered their web projects for sale online. 5 net art critics wrote about each work in this context. This is Rhizome's May 22, 1999 post on "Transmute," an online and bricks-and-mortar exhibition that I guest-curated at the Museum of Contemporary Art in Chicago in 1999. The MCA does not maintain the URL for the online interactive component of the exhibition, which included "virtual artist" and "virtual curator" interfaces designed in collaboration with an interactive designer, and involved participation from museum visitors, online users, etc. Textual and image information regarding this online exhibition will be included in my forthcoming JRP|Ringier book, "Art is a Problem" (distributed by D.A.P. ).